I'm very pleased to present work I have been a part of over several decades as a designer and architect. I was designing buildings at age twelve, and initially pursued professional studies and work in New York City, earning a Bachelor of Architecture from Pratt Institute and a License in Architecture in New York State. My work in New York City focused on the adaptive reuse of historic structures. I moved to California to work in the firm of Christopher Alexander, and subsequently studied with him at the University of California in Berkeley, earning my Masters in Architecture there, and a state license in 1990. 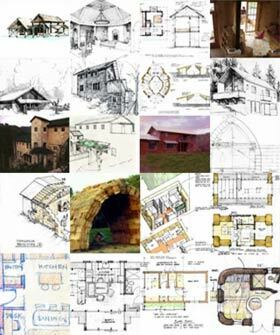 In 1993 I designed my first straw bale building, only the second in the state to receive a building permit, and the subsequent popularity of straw bale construction has permitted me to focus on ecological design, mostly in new buildings but also renovations of existing ones. For a decade this work was in thefirm of Dan Smith & Associates. 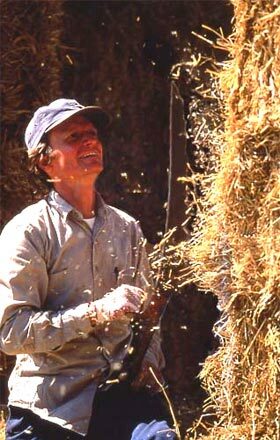 I introduced the firm to straw bale construction, which quickly became their mainstay. In 2001 I returned to individual practice, in part to expand the scale of my work to include helping groups such as intentional communities, monasteries, and retreat centers create better neighborhoods with their facilities, as shownin the planning section of this web site. I also sought more time to investigate design problems that interested me, but had no commissioning clients, especially small dwellings and vaulted bale structures, such as the designs in this web site's prototypes section. In addition to my design and planning work, I lecture and lead workshops on design, neighborhood planning and natural building several times a year, at Permaculture Certificate courses (see the web site permaculture.com), conferences of retreat center directors, and gatherings of natural builders. Examples of my work in these realms are presented here. Most all of the drawings, and all of the renderings, are my handiwork. I hope you enjoy the works shown here as much as I have enjoyed producing them.